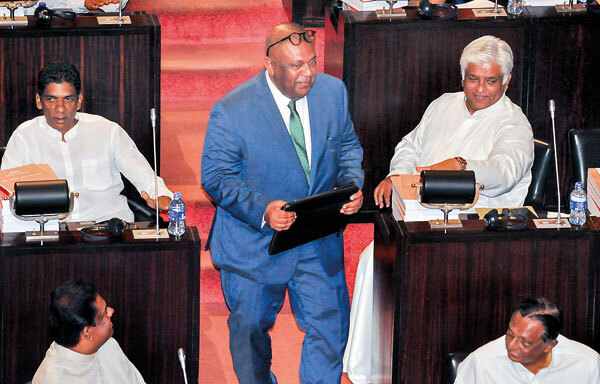 Finance Minister Mangala Samaraweera enters Parliament to deliver the Budget Speech. Government Ministers agree that as opposed to last year, this year will be an easy one to effect promised reforms in the budget, some years ago. Education, housing and construction, and transport sectors were generously allocated funds at year’s budget. Ray Abeywardena, Chairman Colombo Stock Exchange (CSE) thought this budget is an extremely good one that is well balanced. “This budget proposes a mix of measures to balance short-term macroeconomic pressures in the economy with the country’s long-term development agenda. The fact that the budget continues to focus on fiscal consolidation despite it being an election year is commendable and the Government’s efforts to not deliver a populist budget should be acknowledged,” he told the Business Times noting that this year’s budget continues to champion free trade, free enterprise and global markets whilst also addressing Sri Lanka’s growth through initiatives such as Gamperaliya and Enterprise Sri Lanka. The budget’s initiatives to encourage greater FDI via incentives such as capital allowances for high value investments over US$100 million is a sound initiative which should help the country continue to achieve the high FDI it attracted in 2017 and 2018, he said. Support has been extended to the export industry for the manufacturing sector, Rohan Masakorala, CEO, Shippers’ Academy Colombo told the Business Times. Some Rs. 1.3 billion has been allocated to the rubber industry and allocations have been made to the National Exports Strategy, he added. Proposals pertaining to the exports sector in the form of Rs. 800 million and Rs. 500 million allocated to boost the rubber plantations and to boost production/exports of rubber products and support Rubber Research Institute were good. Mr. Masakorala noted that Ceylon Cinnamon is facing various issues. “This budget has promised that all cinnamon exports will be checked for quality before export. Also Rs 75 million is allocated for a Cinnamon Training Center which is a good mechanism to ensure quality cinnamon exporters are protected.” He said that Rs 500 million is allocated for the development of the Enterprise Sri Lanka Programme where Small and Medium Enterprise exporters could benefit. There is also direct support for the exporters with Rs 250 million allocated for National Export Strategy. There is potential protection for the industries facing difficulties when trade is liberalised through the Trade Adjustment Programme. A Trusted Trader Programme is to be implemented for cargo clearances where established exporters with good track records will benefit, Mr. Masakorala added. The Economic Surcharge for IT and tourism was removed, he added noting that it’s an overall good budget and is going beyond handouts. Credit to the less privileged has been addressed which will help reduce the gap between the rich and the poor, he said. “The good thing is, it is really not targeted for an election which was expected by many,” he added. Hiroshini Fernando, CEO RIL Property told the Business Times that removal of Nation Building Tax ( NBT )from the main contractor will reduce the construction costs. “Also the tax incentives for large scale projects on its imports such as NBT, VAT and CESS exemptions along with duty and other tax waivers on items on the negative list will incentivise investors to invest on large scale projects,” she noted.